It’s that time of year again my friends! The Summer may have just begun but, for many of us that homeschool, so has the planning season! Now, I know that quite a few of you have been anxiously awaiting this year’s homeschool planner. Our last few planners have always done very well and each year we try our best to use the feedback that we receive from you, along with our own ideas, to make the next one even better. Well, the wait for this year’s planner is over! We have been working tirelessly over the past few months to create something that I think you are all going to love! This bright and cheery planner still contains many of the pages that you’ve come to expect in our planners, plus so much more! You’ll notice when you first access the planner that the year at a glance calendar is still right up front. The main difference this year is that this planner was built so that you can use it for multiple years! Tired of looking for a new planner that will suit your needs each year? Problem solved because this one will last you until 2020! Within this year’s planner, you’ll find all of the elements that you know and love from previous versions, like pages for yearly, monthly, weekly, and daily planning so you can pick and choose the method that works best for you and your family. Forms for keeping track of field trips, to-do lists, reading logs, needed supplies, attendance and grades are all still included as they have been in previous years. What makes this year’s planner different? There are a couple of things that really stand out this year! First of all, we have reworked this planner so that it can be used for multiple students at once. This was such a big request from you and we wanted to make sure that that was incorporated into the finished product this year! Second is the portfolio section. While many of you may not be required by your state to keep a student portfolio, there are just as many of you that are as well as some of you that would like to even though it isn’t required, so we added one. Within the student portfolio section, you’ll be able to keep track of each individual student’s progress as well as their educational plan, if that is required by your state. You’ll also be able to keep track of field trips, reading logs, and supply lists for your students individually. The biggest difference between this year’s homeschool planner and those that we’ve done in the past is that this one is entirely editable! From typing in your daily lesson plans if your choose, to adding your student’s photo to the front page of their student portfolio, you’ll be able to edit the entire planner, right on your computer! You’ll notice when opening up the planner that there are quite a few more pages than there have been in years past. The reason for this is because we have made them editable. Now, there are plenty of pages for you to plan out your entire homeschool year without ever printing the pages off! So whether you’re more of the pen and paper type and prefer to have everything printed off, or you’d like to fill it out and keep it on your computer to save yourself some printer ink (that stuff is like GOLD! ), you’re good either way! Just open the planner up in Adobe Reader and you’ll be able to edit each of the pages for your homeschool. When you first open the homeschool planner, you’ll find a table of contents that lists everything included within the planner, but that’s not all! We’ve also included bookmarks within the file this year to make navigating and skipping around even easier. Within your Adobe program, simply expand the toolbar that includes your bookmarks and you’ll be able to browse through all of the pages or skip ahead to the various student portfolio and other planning sections when you need them. 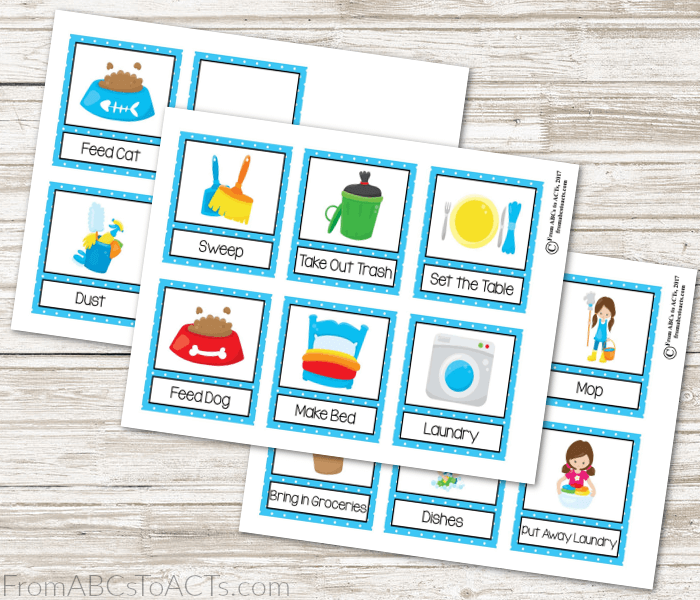 You can purchase the entire 3-year homeschool planner, which comes with our printable chore chart cards as a bonus, in the From ABCs to ACTs shop.